Belkin has unveiled three new surge protectors that will be able to make any cable management whore—like myself—jump with joy. They will be releasing the Concealed Surge Protector, Compact Surge Protector and Clamp-On Surge Protector this October. The Clamp-On Surge Protector is the one we're looking forward to the most. No more piles upon piles of cables on the floor. Finally cables will be able to be run without touching the ground, and staying out of sight. Clamp it anywhere—computer desk, home theatre stand, bathroom, work bench, etc. It will be available for $69 $35 and include six outlets and a 10-foot power cord. The Concealed Surge Protector is built for organization. 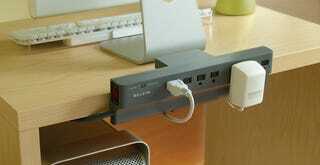 It will power your gadgets via 11 outlets while organizing and hiding cables away. Safety and organization is key—the Concealed Surge Protector is great for kid-proofing a house. $49. The Compact Surge Protector is a small surge protector that provides organization in a nice white bundle. There are a total of eight outlets—four regular and four for block-sized AC adapters. It also includes phone cable protection and will retail for $39. Hit the jump for more photos of each.